Multiple Aces in a Tarot card reading can indicate good fortune. Card deck used is The Pagan Otherworlds Tarot. Before we begin, I should point out that I interpret Aces in a couple of different ways. Obviously, they can symbolize beginnings and fresh starts. 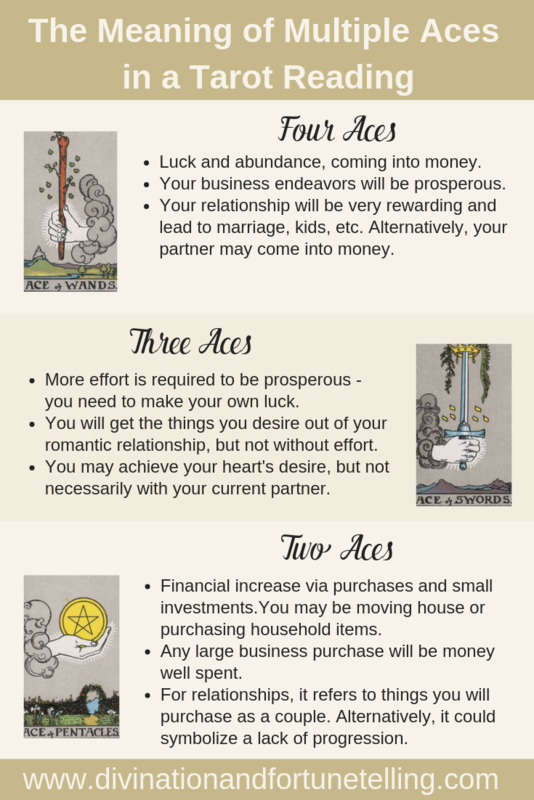 However, I also feel that getting many Aces is a sign of good luck and fortune; the reason why, is because having multiple new beginnings can often be because you will come into a large amount of money. Money can give you the freedom to travel, buy a new home, car and so on. The below meanings are based largely on my own experiences with reading Tarot cards. If you do not agree with these interpretations, feel free to come up with ones which feel right for you and your circumstances. Receiving four readings in your Tarot card reading. In general readings, when you receive four Aces in a Tarot card reading, you can expect great luck, abundance and time spent living the good life. If a seeker ever jokingly asks you if they’re going to win the lottery, with 4 Aces in their reading you can tell them, yes! I would say that it is probably best to get four Aces in one Tarot spread if you’re performing a business or career spread. If you hate your job, then four Aces can mean that something major will happen which will replace your income, allowing you to leave your job. For business readings, the four Aces can mean that you will do very, very well with regards to bringing money into your company. It is possible that you will make more money in your business than you could hope for from even a lottery win! You’ll receive more luck than others will think you deserve. Usually, I would read four Aces as very good for love readings. I feel as though it can predict that you will get everything you want from life with regards to relationships (marriage, kids, etc). Not always from the person you want, but you will get it. Alternatively, 4 Aces in a love reading can mean that your lover will be the one to come into a large amount of money. When it comes to three Aces in a Tarot card reading, I interpret them in a similar fashion to how I interpret 4 Aces, but to a lesser extend. Three Aces in one spread usually implies more effort is needed than would be required for four Aces. For example, in business or career readings with four Aces fortune is largely on your side. However, with three Aces you will be somewhat fortunate but also make your own luck through hard work. When they appear in love readings, three Aces can mean that you will get the things you desire (marriage, kids) but not without effort. I do not feel as though for specific relationships, three Aces is not a good omen. You will achieve your heart’s desire, but not with this partner (for more about how I interpret Aces in love readings, read the entry for two Aces below). I usually read two Aces as symbolizing purchases and small investments. The reason why, is because Aces can predict new things coming into your life and financial increase; two means there will be more than one. Also, it is very common for two Aces in appear in Tarot readings where a move of house is on the cards. The Aces symbolize the things you buy for your house, such as furniture, TVs, appliances, and things of that nature. In business readings, two Aces can represent major purchases which you make for your business, such as a new computer, iPad or smart phone. Don’t worry, as these investments will be worth your while. If you do not yet have an office, one may be in your future. In general, I wouldn’t really read two Aces in a love Tarot card reading well, especially if one of them appears in an outcome or future position. I usually read Aces in the future as predicting a lack of progression in your relationship; the fact that there are two just reinforces this idea. Your relationship is not evolving from the ‘beginner’ stage. However, in some romantic readings which look positive two Aces can predict that you will purchase things as a couple. For example, if you’re moving in together or relocating this can appear as two Aces. Art Illustration: Is there any special significance to receiving two, three, even four Aces in your Tarot card reading? Have you recently performed a Tarot spread for it to have multiple Aces showing up? If you’re curious to know what it means when you get lots of Aces in your Tarot card reading, look no further because I have answers!